Single crystal with very well defined faces and edges, complete on both terminations, translucent and with a very well defined color zoning on the upper termination, that has fine dissolutions fissures on the pinacoid. Complete tabular crystals, one of them clearly dominant and of considerable size for the locality. The crystals, on Muscovite matrix, are very bright and have good transparency and an excellent clear uniform blue color. They are formed by a short prism, a big terminal pinacoid and the faces of three dipyramids, which is relatively infrequent in Beryl. 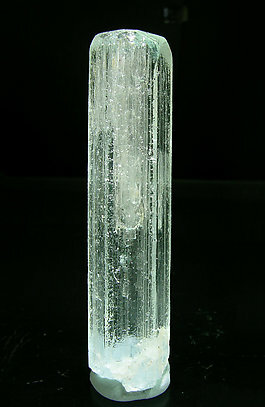 Very short prismatic crystal with a perfect flat termination and the other showing dissolution shapes. The sharpness of faces and edges is excellent and so is the color, very deep. 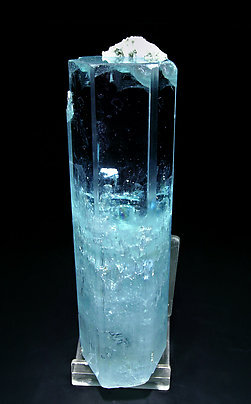 Parallel growth of two doubly terminated Beryl (aquamarine variety) crystals, with a flat termination on one end and very well defined acute pyramids on the other end. 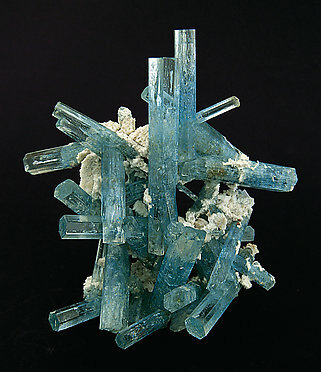 They are transparent, very bright with a pale and uniform blue color and are on a matrix of tabular Albite crystals. We’ll send to the buyer the original label and also a copy of the computer card with the full collection catalog text. 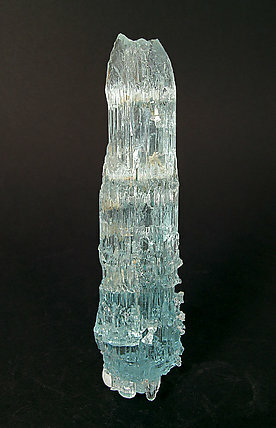 A complete floater crystal with parallel crystal domains and prominent dissolution forms. 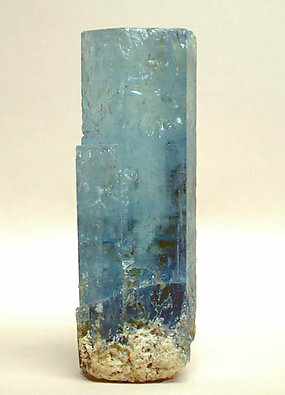 It is extraordinarily clear and has a very vivid and uniform blue color. The sample is from the Daunis collection (a reference for the local prospectors of the Barcelona area during the period 1970-1980). 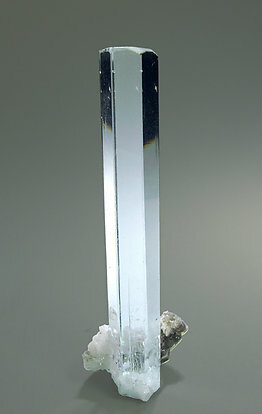 Floater and doubly terminated crystal with a pinacoidal termination at one end and with polycrystalline regrowth at the other end. 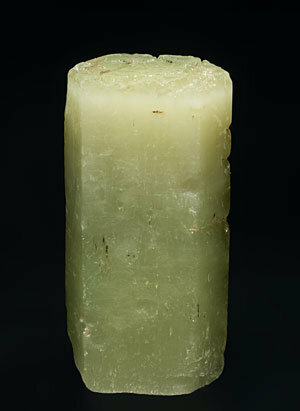 It is transparent, has a uniform green color and inclusions of leafy Muscovite aggregates. The original information has no specific data on the locality but, due the characteristics of the sample we believe it must be from the Virgem da Lapa area. From the A. Mayor collection. 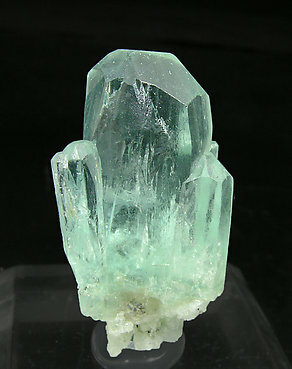 A complete floater Beryl (aquamarine variety) crystal with parallel growths and rich with dissolution surfaces and very sharp edges. 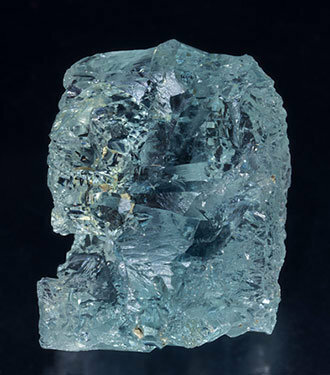 The crystal, with small black oxide inclusions, has a very vivid and uniform blue color. Other oldie from Oliete's collection. 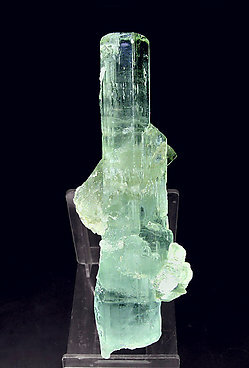 An extremely huge (for the locality) Aquamarine Beryl crystal. It is a floater with an intense bluish color. Material from this locality is no longer available and this specimen is much better than the normal production (when it was productive). 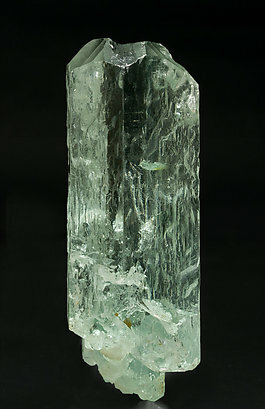 Very well-defined prismatic crystal with small pyramidal faces and the flat termination of the pinacoid. In its core there are a lot dissolution channels with very visible bubbles. Parallel growth of intense green color and extraordinarily rich in terminal faces consisting of three pyramids and the pinacoid. 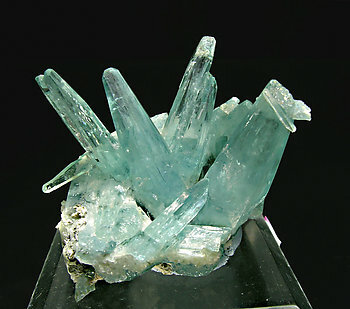 Group of Beryl (aquamarine variety) crystals, one of them clearly dominant, doubly terminated, with the prism faces beveled by a pyramid and the pinacoid. They are very transparent and bright, with a very well defined and uniform sky-blue color. They are on a feldspar matrix with small black Schorl crystals. 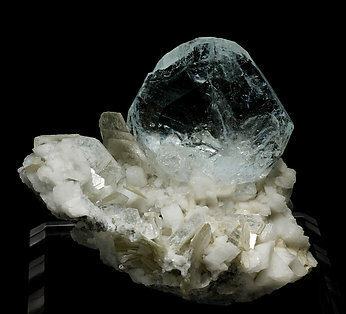 A dramatic floater made up of a group of prismatic, brilliant crystals with sharp faces. 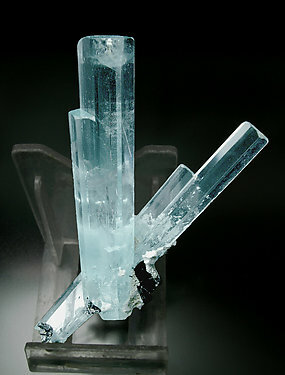 Near the ends are clear colorless areas that contrast with the intense blue of the rest of the crystals, some of which are doubly-terminated. The esthetics of the specimen, as you can see in the photo, is exceptional. Floater, complete in all sides, different with its etched faces but nevertheless with a good form. An old classic. 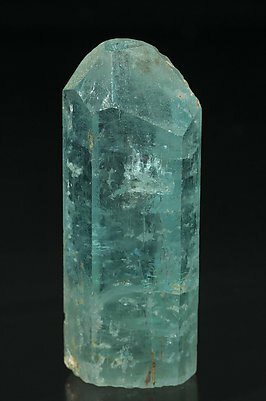 Group of Aquamarine crystals of good color with an unusual morphology; clear curvatures of the prism faces, and terminated by a small pyramid. On Albite matrix with Muscovite. 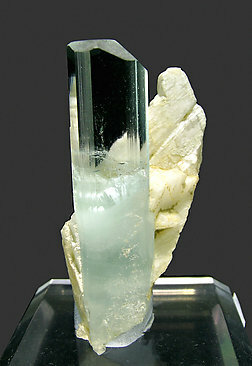 A floater and doubly terminated crystal. It is transparent and has a uniform blue color. Both terminations of the crystal are very different, one of them showing an excellent growth of pyramidal faces and a small pinacoidal surface and the opposite is flat, completely pinacoidal and with fine polycrystalline growths. 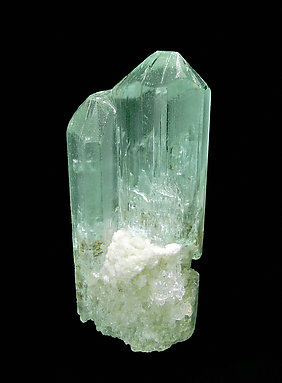 Doubly terminated prismatic crystal, transparent and of an good color. The main termination is very rich in pyramidal faces, combined with the flat pinacoidal face. 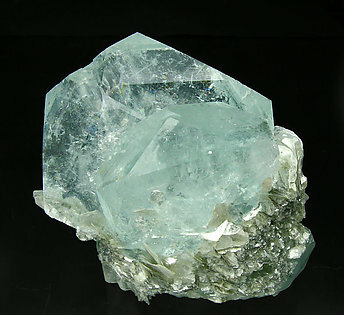 The other termination is more complex and it is partially hidden by a second crystal, smaller and with abundant faces of dissolution. A parallel growth of two prismatic crystals with quite acute and very well defined pyramidal terminations. Color, luster and transparency are excellent. 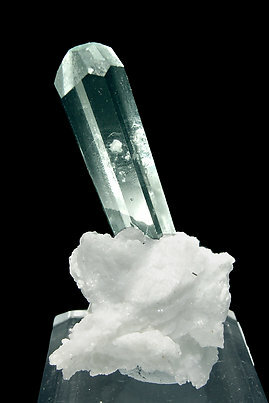 A small bit of Albite matrix appears at the base. We especially like this specimen. 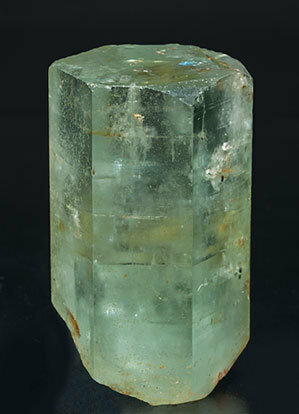 Group of prismatic crystals of excellent color, a considerable size and transparency with very well defined faces and edges and small zones that present forms of dissolution. Prismatic crystal of excellent color and very transparent which is terminated with the faces of the pyramid and the pinacoid. On an Albite matrix. The crystal is formed by the hexagonal prism and a relatively complex termination formed by the faces of two pyramids and the pinacoid. Transparency and luster are magnificent and the specimen is very esthetic because it is on an Albite matrix. 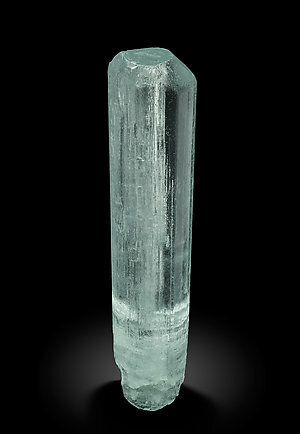 Doubly terminated crystal incredibly transparent and clear, without noticeable inclusions. No internal fractures that could cast a shadow over transparency. Upper pinacoidal termination is totally clear and transparent. The bottom termination forms a well defined face, but translucent. 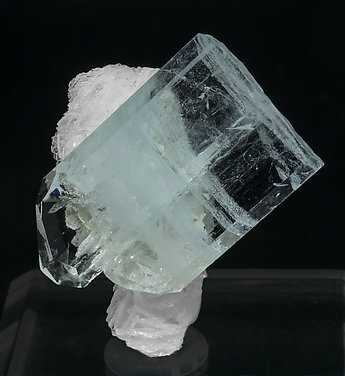 On an Albite matrix with laminar Muscovite crystals. Very elegant. 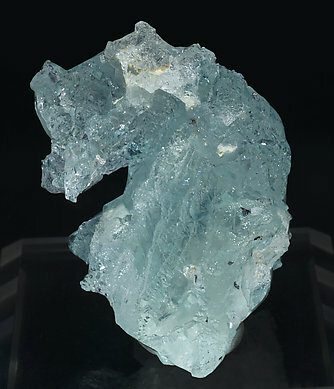 Tabular crystal of Beryl (Aquamarine), more aerial than usual with samples from this locality, very transparent and bright, clear color, very rich in faces and on a matrix of Albite and Muscovite crystals. Very beautiful group of prismatic crystals, some of them doubly-terminated, very clear and of an excellent color and luster, with Albite and Schorl. Magnificent! 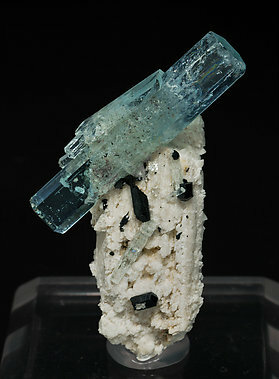 This aquamarine crystal is doubly terminated and complete with its upper part completely transparent and with growth channels and inclusions of Tourmaline (Schorl) on the lower. The terminations are very different. 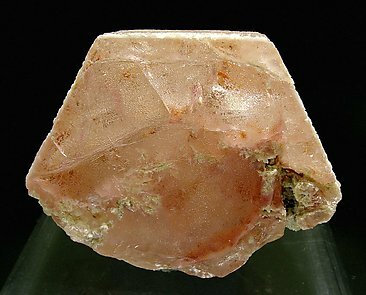 The main one, in which there is a small group of Albite, is formed by a transparent pinacoid and small pyramid faces, and the lower has an irregular pave due to recrystallization. The color is extraordinary as well as the transparency and luminosity.